As an ISB account holder, you can transfer money between your ISB accounts – 24 hours a day, 7 days a week. Do this from the convenience of your home or office (or any secure online connection) – via ISB Internet Banking. You must be listed as one of the account owners. Your name and Social Security Number must be on file with ISB and must be linked to the account. Once your ISB Internet Banking account has been established, you will be assigned an Access ID to use each time you LOG IN. If you don’t remember your case-sensitive Access ID, please contact Investment Savings Bank during business hours. Obtaining info from your ISB Loan Accounts and ISB Lines of Credit such as balance and transaction history (payments, advances on lines), payment due dates and amount(s) due, current interest rate, annual percentage rate (APR), available credit, loan origination date, etc. Obtaining info from your Certificate of Deposit (CD) Accounts such as balance, transaction history, current annual percentage yield (APY), maturity date, interest paid to date, etc. *Limitations apply. 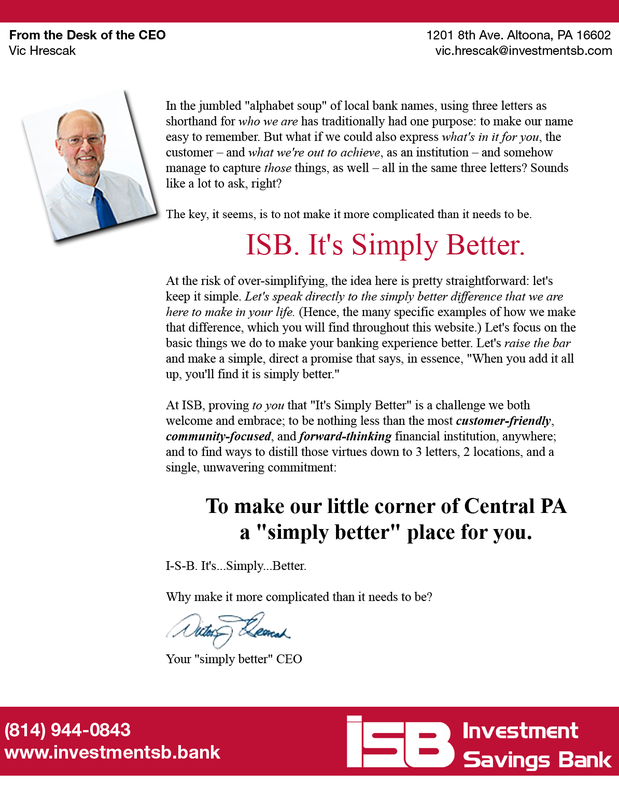 If you have questions about specific account functions available through ISB Internet Banking, please call (814) 944-0843 or visit a branch office. Checking Accounts – Your ISB Checking Accounts are fully accessible and functional (meaning you can transfer money into and out of your ISB checking accounts without limitations) via ISB Internet Banking. NOTE: Because Christmas Club and Vacation Club accounts are – by design – set up so that you only put money into them until you are ready to access the entire account balance and close the account, you may only deposit funds into these accounts via ISB Internet Banking. – cannot be processed online. All Loan Payoffs must be made in person. 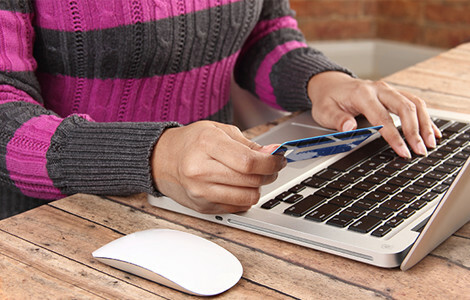 Bill Pay – You may also elect to pay your bills online via ISB’s separate (and optional) Bill Pay feature. ISB Internet Banking provides an extra layer of protection to secure your financial information against fraud and identity theft. Once your ISB Internet Banking account has been established, you will be assigned an Access ID to use each time you LOG IN. If you don’t remember your case-sensitive Access ID, please contact Investment Savings Bank during business hours. You agree not to allow anyone to gain access to the Service or to let anyone know your Password used with the Service. You agree to assume responsibility for all transactions initiated through the Service with your Investment Savings Bank Access ID, up to the limits allowed by applicable law. While Investment Savings Bank continues to provide customers with the level of on-line security we believe necessary and appropriate, customers who share their Access IDs and Passwords are giving up the full benefit of our security measures and legal protections to which they may be entitled. Never reveal your personal account information – especially over the telephone. No Investment Savings Bank representative will ever call to ask for your Access ID or User Password. If your Password has been lost or stolen, call Investment Savings Bank immediately at (814) 944-0843 or (814) 695-7551 between 9 AM and 4:30 PM, Monday thru Friday. Telephoning Investment Savings Bank is the best way of minimizing your losses (if any are incurred). You may also restore the security of your Internet Banking service by immediately changing your Password. Automatic Transfers for the purpose of paying loans at the same institution. Withdrawals and transfers to another account at the same institution that are made by mail, messenger, automated teller machine (ATM) or in person.